I am the mom of three little boys. I am surrounded, outnumbered, and totally submerged in all things boy, all day, every day, and I have come to embrace this. 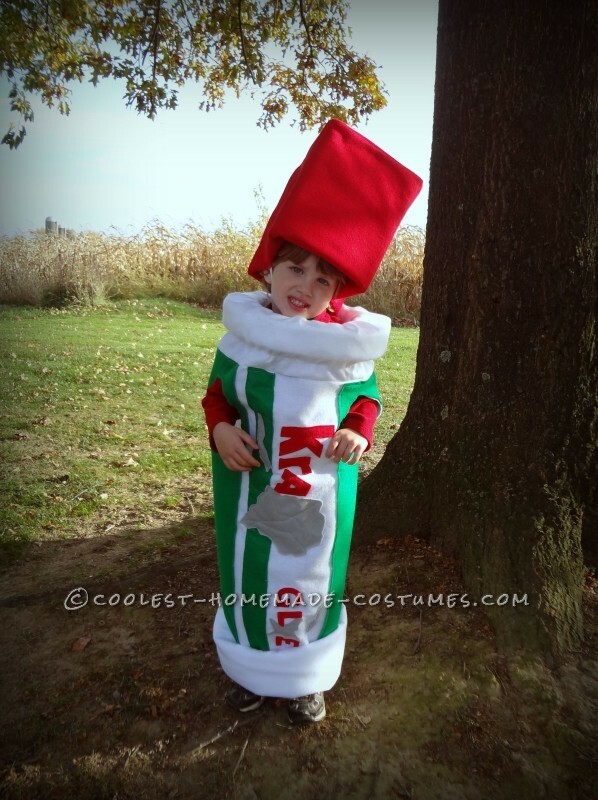 Halloween costumes are no exception to this rule. 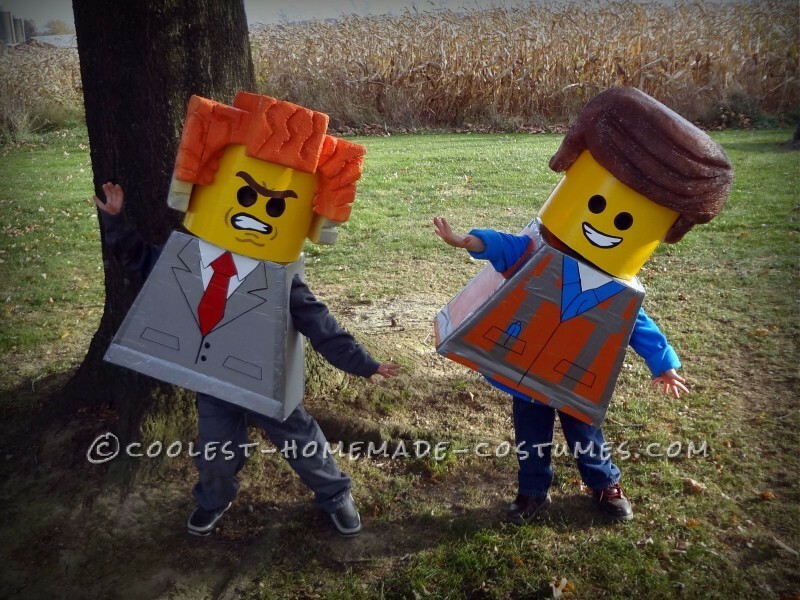 Each year, I like to do the boys’ costumes as one common theme. (And they’re still young enough, so I can get away with it.) Once they were all pumpkins (my very own little patch). Last year, they were the Three Blind Mice. But this year required something a little more “mature” and “cool”, yeah I know, since the oldest is now a grown-up kindergartener, and all. 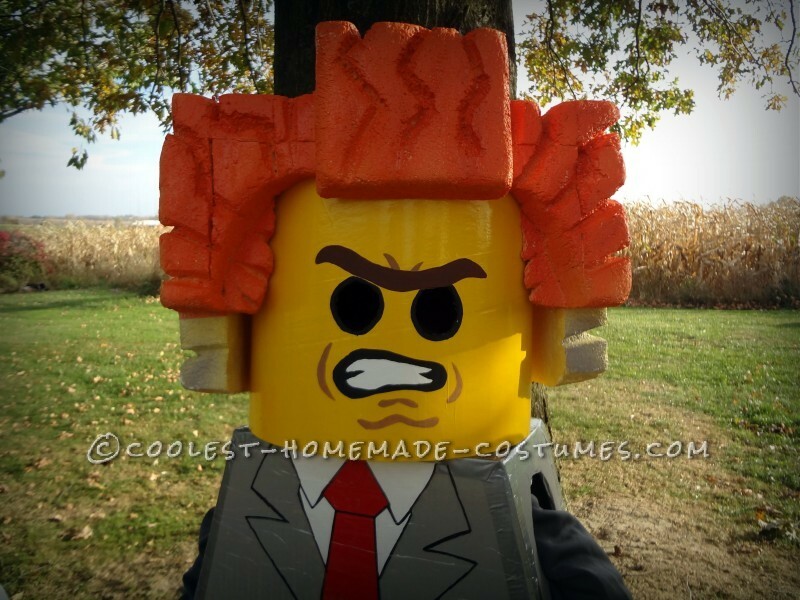 So after much brainstorming, helpful (and unhelpful) suggestions, and general debating, the Lego Movie theme was chosen. 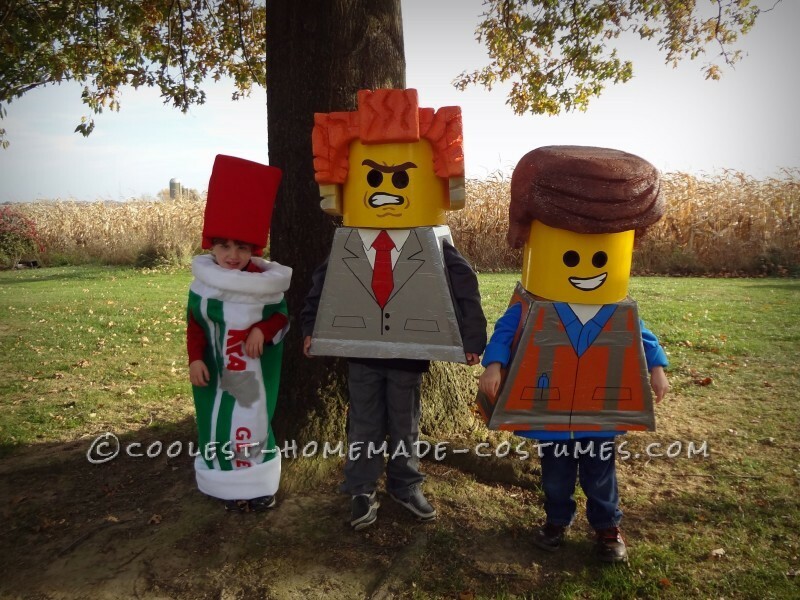 I poured over internet sources of any and every individual who had previously (successfully) attempted a Lego man costume – of any variation – and combined what I learned from each of those sources with whatever I could come up with on my own, to create this dashing trio. Basically, the heads and bodies are cardboard – cut, taped, painted, and detailed. The hair is foam – cut, stacked, glued, carved, shaped, sanded, primed and painted. (Seriously? Foam everywhere. It looked like it snowed in our garage for four weeks, and in the back of our minivan.) For the Kragle, I went to my sewing machine and used lots and lots of felt. I cut out all of the letters and shapes on the front and then stitched them on as closely to resemble an actual bottle of Krazy Glue as possible. To get the round neck/tube opening part to hold its shape, there is also a ring of foam in there. The hat – the Piece of Resistance – has additional cardboard lined inside to help it hold the rectangular shape. In all honesty, so much of this was just trial and error. Believe me when I tell you that there was plenty of both, but it was worth it. The reactions we have received so far when we’ve been out and about Trick-or-Treating with them have been awesome. Kids went nuts recognizing the characters and yelling hellos. Adults were so freely giving their compliments. These costumes are by no means perfect and I have learned a lot over the past couple months – things I would have done differently, ways to save steps, money, energy, etc – but they were so much fun to make.